A joint mission between NOAA and NASA has yielded data showing just how much brighter Earth is during the holiday lights season. In some places, the effect makes the area 50% brighter than on an average day. The data comes from a combination of technologies. The first is the Suomi NPP satellite, which carries an instrument called a Visible Infrared Imaging Radiometer Suite, or VIIRS. VIIRS can detect the glow of lights on Earth in incredible detail. 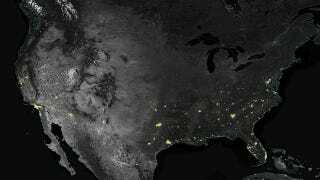 The data from VIRRS on Suomi NPP was filtered through an advanced algorithm that removes out moonlight, clouds and airborne particles, leaving only the illumination from manmade lights in cities and towns. In the United States, for example, Black Friday marked the start of the brightening. In the suburbs, nighttime illuminate grew by 30-50%, while cities "only" brightened by 20-30%. "Even within majority Muslim populations, there are a lot of variations," [Eleanor Stokes, a NASA Jenkins Graduate Fellow and Ph.D. candidate at Yale University's School of Forestry and Environmental Studies] said. "What we've seen is that these lighting patterns track cultural variation within the Middle East." With the high resolution provided by VIIRS, that variation even appears at the neighborhood level. [ Miguel Román, a research physical scientist at NASA Goddard and member of the Suomi NPP Land Discipline Team] and Stokes used data from Cairo to divide the city's neighborhoods into different socioeconomic groups, based on available records of voting patterns, access to public sanitation, and literacy rates. Some of the poorest and most devout areas observed Ramadan without significant increases in light use throughout the month, choosing – whether for cultural or financial reasons – to leave their lights off at night. But during the Eid al-Fitr celebration that marks of the end of Ramadan, light use soared across all study groups, as all the neighborhoods appeared to join in the festivities. This is telling researchers that energy is providing services that enable social and cultural activities, Stokes said, and thus energy decision-making patterns are reflecting social and cultural identities. Here's a video from NASA going into more detail about the research.